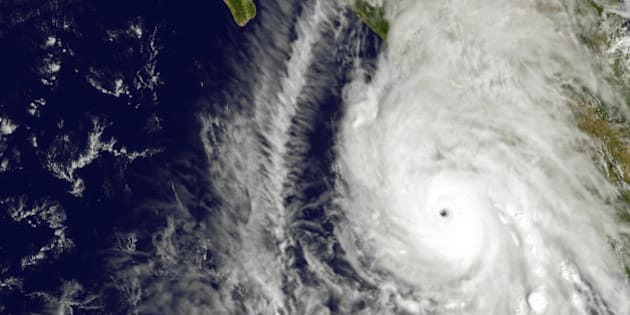 Australians are being warned to stay away from the south west coast of Mexico where one of the strongest ever recorded hurricanes has barreled into the coast. Hitting land on Saturday, the hurricane is already packing wind gusts of up to 378 km/h, and extensive damage is expected. The huge Category 5 Hurricane Patricia hit after weakening slightly, with sustained winds dropping to around 300km/h, as tourists and locals in resort towns like Puerto Vallarta and Manzanillo scrambled to find safe shelter. Small fishing villages about 130 miles south of Puerto Vallarta are said to be taking most of the initial impact, which could be potentially catastrophic to the region, although details about damage are so far scarce. DFAT has urged Aussies to stay away from the region until it is safe to travel. “The travel advice for Mexico has been reissued recommending Australians delay all travel to areas likely to be affected by Hurricane Patricia until local authorities confirm it is safe," DFAT told The Huffington Post Australia. "Australians in the area should follow the instructions of local authorities, hotel staff or their tour operator, seek safety in a secure shelter and monitor local news and weather reports. " The hurricane has been compared with Typhoon Haiyan, which decimated the central region of the Philippines in 2013, killing more than 6,300 people and forcing 4 million people to leave their homes. OxFam said it was ready to respond to help the estimated 400,000 people in the path of the Category 5 storm, with the NGO's Chief Executive Doctor Helen Szoke saying Patricia could have a catastrophic impact. “Hurricane Patricia’s extreme winds, intense rainfall and fearsome waves predicted to reach up to 8 meters in height have the potential to cause mass devastation on coastal communities,” Szoke said. DFAT said Manzanillo and Puerto Vallarta airports have been temporarily closed, and local authorities were evacuating people to storm shelters. "The hurricane is now expected to bring extensive damage to coastal areas between San Blas and Punta San Telmo, and significant flooding, landslides and mudslides as the storm moves inland," DFAT said. "If you are in the area you should follow the instructions of local authorities, hotel staff or your tour operator, seek the safety of a secure shelter, and monitor local news and weather reports. DFAT is reportedly aware of a small number of Australians in the impacted region.